Chen style Tai Chi and Qi Gong taught in a traditional manner. Please plan to arrive about 10 minutes before the class. Private lessons are available for one on one or group bookings either at the Hope Centre or any suitable location. Why not join us and experience for yourself the benefits of Tai Chi and Qi Gong, the 8 step form is excellent for beginners as it is quite easy to remember but will also challenge experienced practitioners as it contains many movements that have deeper qualities. Wear loose comfortable clothing with flat shoes or bare feet. All ages and abilities welcome. Each session will begin with a traditional warm up allowing the body to start to release any tension it has built up during the day and to allow the bodies energies to start to move. We then move onto Qi Gung to strengthen the internal energies and finally we practice the 8 step Tai Chi form. Tai Chi – Ba Jia (8 Step) Form and Chen 18 Step Form – practice serves to bring balance and harmony to the practitioner. The beautiful circles and graceful moves serve to provide a powerful self-healing and fitness system that does not overstress the joints. Tai Chi is one of the 5 healing arts of Traditional Chinese medicine along with Qi Gong, Acupuncture, Herbs and Tui Na (acupressure) massage. Qi Gung is an internal system of breathing and cultivating Qi, which translates loosely as energy, it can involve movements or be stationary and is complementary to Tai Chi. Qi Gong has been practiced in China for over 5000 years and provided the basis for most of the healing arts throughout China. Baduanjin Qi Gong (Eight Treasures) is one of the most common forms of Chinese Qi Gong used as exercise Variously translated as Eight Pieces of Brocade, Eight-Section Brocade, Eight Silken Movements and others, the name of the form generally refers to how the eight individual movements of the form characterize and impart a silken quality (like that of a piece of brocade) to the body and its energy. 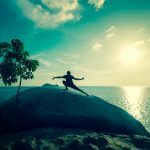 Baduanjin is primarily designated as a form of medical qigong to aid health and well-being rather than a religious or martial forms of Qi Gong. This exercise is mentioned in several encyclopaedias originating from the Song Dynasty. The Pivot of the Way (Dao Shi, c. 1150) describes an archaic form of this Qi Gong, the Ten Compilations on Cultivating Perfection (Xiuzhen shi-shu, c. 1300) features illustrations of all eight movements. The same work assigns the creation of this exercise to two of the Eight immortals, namely Zhongli Quan and Lü Dongbin. The exercise was later expanded from eight to twelve movements over the centuries and was described in the boxing manual Illustrated Exposition of Internal Techniques (1882) by Wang Zuyuan, a famed practitioner of the Sinew Changing Classic set. Nineteenth century sources attribute the style to semi-legendary Chinese folk hero General Yue Fei, and describe it as being created as a form of exercise for his soldiers. The legend states he taught the exercise to his men to help keep their bodies strong and well-prepared for battle. Prof. Meir Shahar notes Yue’s mention as a lineage master in the second preface of the Sinew Changing Classic manual (1624) is the reason why he was attributed as the creator of Baduanjin qigong. This move is said to stimulate the “Triple Warmer” meridian (Sanjiao). It consists of an upward movement of the hands, which are loosely joined and travel up the center of the body. This resembles the second piece, and is largely a punching movement either to the sides or forward while in horse stance. This, which is the most external of the pieces, is aimed at increasing general vitality and muscular strength. This is a bit of a poor translation and the Glare Fiercely should be Look with Intent. The gaze to the fist is to bring Qi to the extremities filling both the Yin Meridians of the arm (Lung, Heart and Pericardium) and the Yang Meridians (Large Intestine, SanJiao and Small Intestine), allowing these Meridians to balance and harmonise. This is a push upward from the toes with a small rocking motion on landing whilst holding soft writs to the lumbar area and allowing the back of the hands to slap gently at the lumbar and sacrum. The gentle shaking vibrations of this piece is said to “smooth out” the qi after practice of the preceding seven pieces. This movement resembles twisting at the waist and lifting a ball from stomach to chest. The twist is achieved by sinking into the floor with alternate feet and thus turning the body much more than is possible with just the waist. This movement opens and regulates the Ren Mai and Du Mai channels. Starting with feet at shoulders width lift the arms behind the body (as much as you can) to above the head, then bending at the knees with straight back (again as much as is possible) descend to the earth keeping the feet flat. Pushing from the heels left the body back to standing and draw the hands to chest then exhale to standing. Why not join us and experience for yourself the benefits of Tai Chi and Qi Gung or for more information please contact the Manchester centre. The 8 step form is excellent for beginners as it is quite easy to remember but will also challenge experienced practitioners as it contains many movements that have more challenging qualities. STEPS usualy runs on the last monday of each month but due to Trafford Council planing rules we cannot open on a bank holiday.